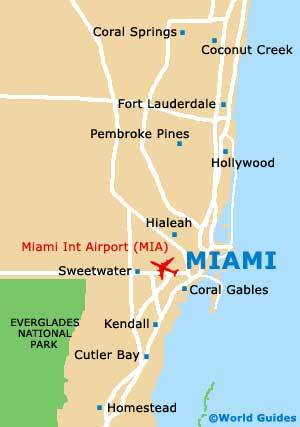 Families holidaying in the sunny city of Miami can take full advantage of the plentiful themed attractions on offer. Parrot Jungle Island is brimming with exotic creatures, as is the Miami Metrozoo, which dates back to 1948 and is actually the biggest and most historic zoological garden in the whole of Florida. At Key Biscayne, the killer whales and dolphins are the principal attractions within the Seaquarium, while next to the Cutler Bay and South Miami Heights suburbs (just off Highway US-1), the Monkey Jungle is home to around 30 different species of primates, living in spacious natural surroundings. For a little more in the way of culture, the Graves Museum of Archaeology and Natural History at Dania will certainly appeal to children, since there are various dinosaur-themed displays. 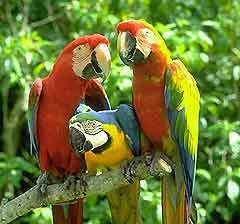 Jungle Island is a popular magnet for children and features numerous friendly parrots and macaws, with colorful rainbow plumage, squawking as visitors wander along shaded pathways past their aviaries. The gardens are designed to protect both residents and visitors from the hot Florida sun and include hundreds of different varieties of shrubs, trees and flowers. Other attractions include waterfalls, a lake with Caribbean pink flamingos, alligators (including albinos), crocodiles, giant tortoises, chimpanzees and other monkeys. There is also an excellent café, with views of the Flamingo Lake. The Metrozoo is one of the most popular tourist attractions for children in the city. Featuring extensive displays of wildlife and a more than 900 species of rare and exotic animals, barriers such as moats and hills are used instead of actual cages to enable the animals to roam freely. 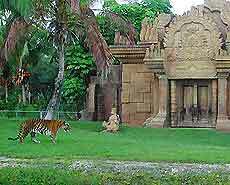 Most of the zoo is outside and rare snow-white Bengal tigers are amongst the main stars at the Metrozoo, which is situated in South Miami. There are more than 920 acres / 372 hectares of jungle at the Metrozoo and other highlights include the black rhinoceros, giraffes, silverback gorillas, zebras, elephant rides, lizards, kangaroos, koalas, an air-conditioned monorail train and feeding displays. There is also a children's zoo area, where children are able to stroke a number of friendly zoo and farm animals. The zoo is highly regarded and is considered to be one of the finest wild animal parks in America. 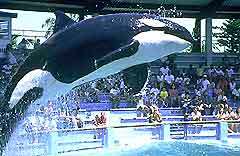 The Seaquarium has huge saltwater pools, with a number of majestic killer whales and friendly dolphins. These creatures are the main attractions, together with sea lions, porpoises and a group of manatees. This 38-acre / 15-hectare complex features regular shows and is always appealing to children. On the hottest days, it is worth considering attending an evening show, when the weather will be cooler and more pleasant. This popular Natural History Museum is situated close to Miami, being located within the Greater Fort Lauderdale area. Highlights include dinosaur exhibits, fossils, rocks, minerals and many other interesting antiquities. Located to the north of the Homestead region, Monkey Jungle is one of the few places in America that actively protects endangered primates. This wildlife park was set up in the early 1930s and covers some 30 acres / 12 hectares, where around 400 different primates run loose. Attractions include covered walkways, which keep visitors close to the monkeys, and a steamy hammock area where baboons, orangutans, gorillas and over 35 different species of monkeys move through the vegetation. 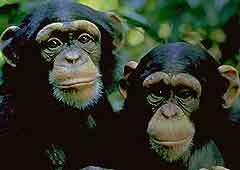 The Monkey Jungle is particularly popular with children and tourists visiting Miami.